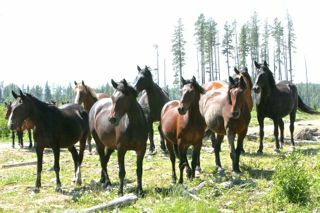 One of the great joys we have is taking our own horses for rides out in wild horse country. 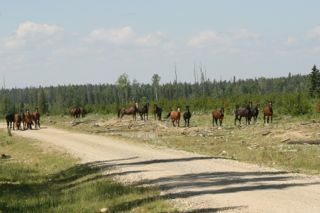 Just going for an enjoyable ride is great, but riding out here is fascinating when you come upon a herd. It was no different this past Friday when we took our two boys out west. Driving down the back trail to where we wanted to unload, we were met by this group sunning themselves around a mud hole. Just after unloading we could hear some crunching in the bushes and looked up to see four young studs peering through the bush at us. Unafraid and very curious they came in to within 30 feet of us to see what we were doing. 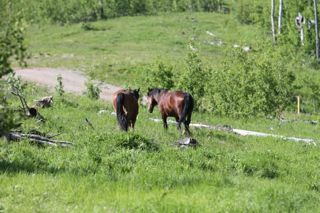 They stayed in the immediate area while we saddled our horses and were still there as we rode off down the trail. One of our horses is Wyley who was rescued many years ago and has turned into an exceptional trail horse. The most amazing thing about him is that he will always let you know when there are other “relatives” of his around. His calmness and trail sense now makes it a joy to take him back into the country he was born in. We had a great ride under ideal conditions. Then upon returning to our trailer this was our greeting. As you can see by this picture, there are no yearlings in these three herds. It is a fact that not only us, but many others have also noticed and are taking note of this. 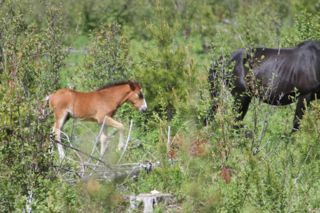 The other distressing point is that a large number of foals born this spring are no longer with their herds. That is the case with the herd in the middle of the above picture. 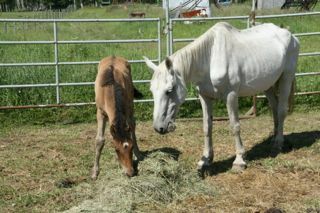 This is a little filly that was with the herd just five days previous. Leaving our horses tied to the trailer we went for a walk around the herd to see whether it was just lying down. Unfortunately it was no where to be found and had succumbed to either sickness or predators. 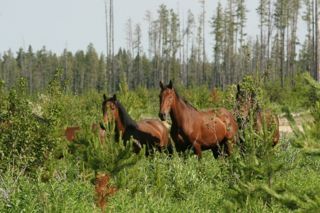 WHOAS strongly believes and will be pushing the ESRD not to have any capture season this coming year due to the large number of horses lost this past winter, that there are very few yearlings left with the herds, and now the loss of a large number of foals this spring. One of the things we noticed on this ride was the abundance of grass growing throughout the whole area we rode. This is a key point because not only were there lots of wild horses but also a large number of deer in the area. 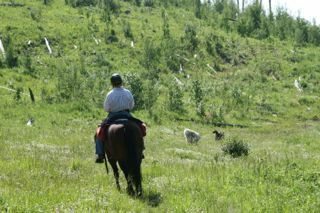 The only trails we rode on were ones made by the horses and they were all in good shape and not torn apart by overuse. A week ago, we were riding down in Sandy McNabb, which has an excellent equestrian campground, horse facilities and trails. This area is used extensively by not only equestrian riders, but also hikers. What we found was that the cattle which had only been allowed in there for approximately 10 days, had decimated many of the lower trails. Also all the small creeks in the valleys were running brown from the disturbance caused to the banks by the cattle (there are no wild horses down here). So when people bring up the argument about horses destroying the environment, anyone would just have to witness what we and many others we spoke to had. Many of the other equestrian campers were upset with the cattle being allowed in this area and the damage they were doing. The individuals and so called experts that make these claims against the wild horses would not be able to substantiate any of that nonsense if they had been able to witness this damage. Don’t get me wrong I do not begrudge the cattle leases or allotments as long as these cattle ranchers stop blaming the horse for their perceived problems on our public lands and recognize that their cattle have more of a negative impact on the environment than any other creatures do. 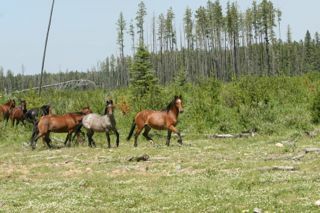 WHOAS had to take in more wild horses this summer than we ever had to in previous years. This is due to several reasons but it is still part of our mandate. However, we are limited to the number that we can take in due space and financial considerations. It is expensive caring, as any knowledgeable horse person will tell you, for a horse. Add on the time that has to be devoted to the gentling process to make these horses adoptable, it can become onerous. We are doing the best we can right now. Hopefully when we have our own facility up and running, and our charitable status, we will be able to work with more rescues as needed. Angel and Sunset will have to remain with us for a period of time yet to allow the filly to be properly weaned and the mare to get back into proper condition. This costs money, but we are not complaining but welcome any support. And for those that have donated, WHOAS and our foster charges thank you. 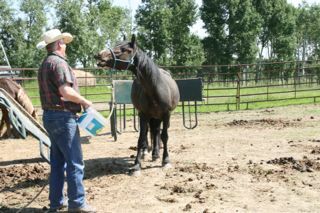 We had a good laugh as Timber walked up to taste what was in the bucket. We made sure he did not get too many as he took an immediate liking to this delicacy! He is doing extremely well and loves to be bathed with the hose. 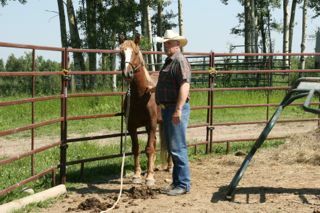 It is nice to know that he has a home to go to as soon as he is gelded, which will be soon. He leads well, goes into the barn calmly to a tie stall, and does love to be scratched. The saddling process is just a short time away. Rex too is coming along very well, becoming socialized and accepting of humans and all the steps he is put through to make him adoptable. WHOAS is still looking for a forever home for him. He still has to be gelded. He displays his wild horse intelligence and willingness to learn. 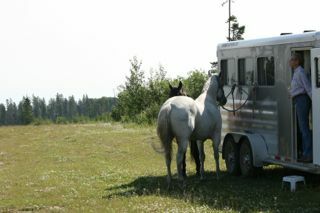 This is what makes a wild horse such a good mount and such good trail horses, just like Wyley. WHOAS continues to look for the support of those who love the wild horses as much as we do and wish to help us in our efforts to have all wild horses afforded a better life.